What is an airbag module reset and why do I need it? For a tool that promotes safety during collisions, many people do not know what airbag modules are or their function in a vehicle. Also known as the airbag sensor, diagnostic unit, and computer module, the airbag module is responsible for receiving information from the collision sensor. That information is then relayed to the airbag sensors and the airbags are deployed during impact. Thus, having a faulty airbag module can prevent airbags from deploying when they are most needed, and can result in dangerous consequences for those in the vehicle. Found in all vehicles, the airbag module is a computer that stores information. Thus, during a collision, the impact data is stored in the air bag module. You will know when this occurs because your airbag light will turn on until the airbag module is replaced or repaired. This information renders the airbag module useless and typically vehicle owners often replace it. However, airbag module reset is a simple process at Safety Restore. The airbag module reset service can fix your existing air bag module and save you money. Air bag module replacement can often cost upwards of $1,000.00. 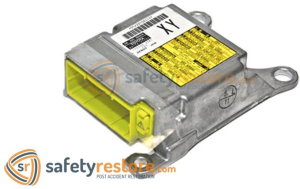 Safety Restore offers airbag module reset in which the original air bag module is used, but any crash data hard codes are reset. Not only is this a cheaper option, but it is less wasteful. Safety Restore uses a OEM factory installed program to erase the crash data for airbag module reset. This process of airbag module reset leaves the airbag module good as new, saving you hundreds of dollars. With 24-hour turnaround time, your airbag module repair will be complete before you know it! If your airbag light is on, airbag module reset is not just necessary, but can possibly save your life down the road. Get your airbag module reset today and save hundreds at Safety Restore.